Every year, we lose more of the men who built Milwaukee's baseball legacy. 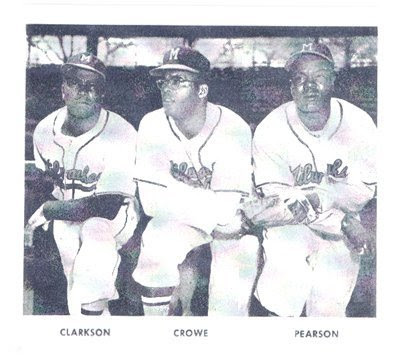 This past January, former Brewer first baseman George Crowe passed away at the age of 89. 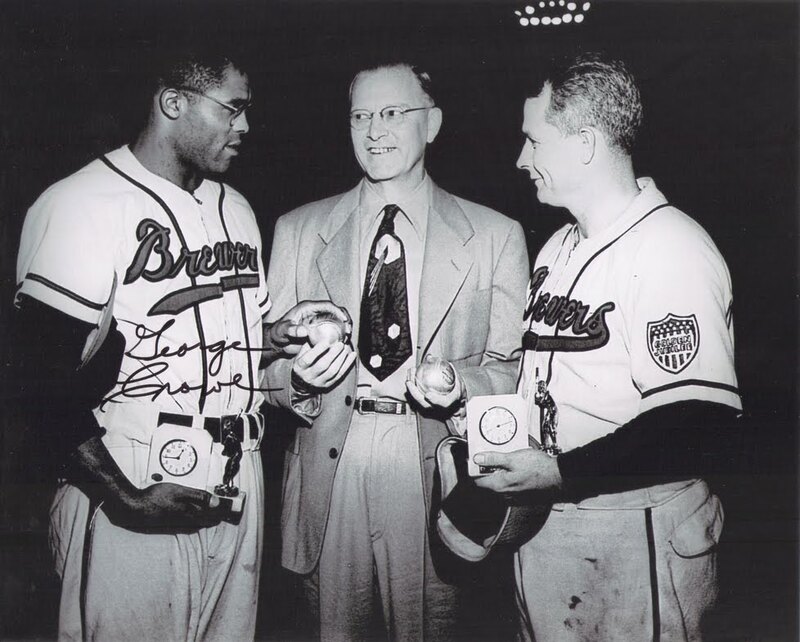 He was signed by the Boston Braves in 1949 as an amateur out of his native Indiana, where he had been a high school basketball star. 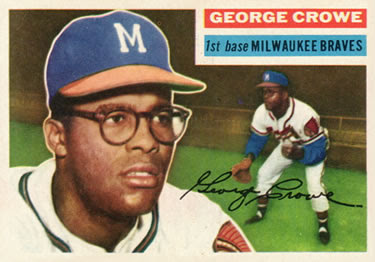 Crowe worked his way to the top of the Braves' farm system in just two years, arriving in Milwaukee for the 1951 season. He was one of three black players to play for the Brewers in 1951, during those early (and all-too-slow) early days of baseball integration. 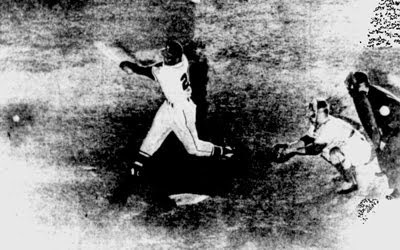 A healthy swing by George Crowe of the Brewers produces a two base hit in the seventh inning of the little world series game with the Montreal Royals at Borchert Field Wednesday night. 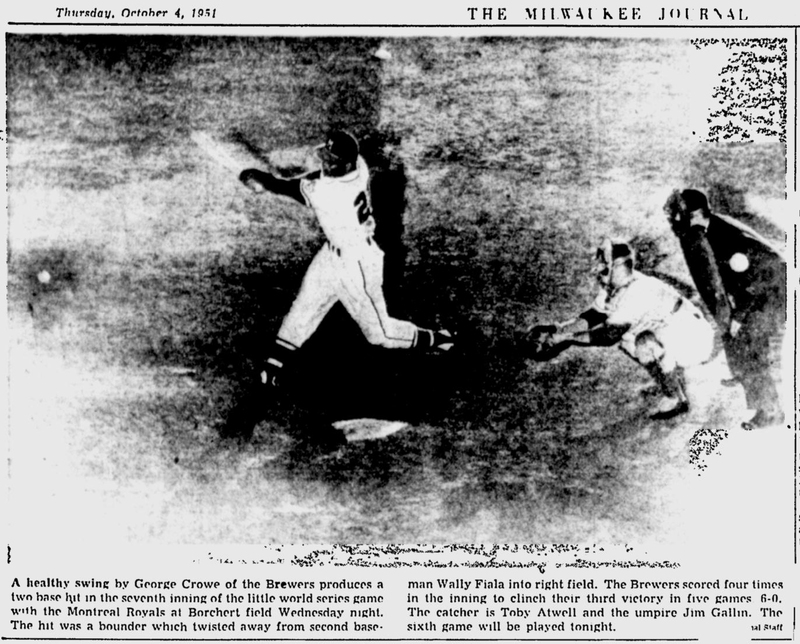 The hit was a bounder which twisted away from second baseman Wally Fiala into right field. The Brewers scored four times in the inning to clinch their third victory in five games 6-0. The catcher is Toby Atell and the umpire Jim Gallin. 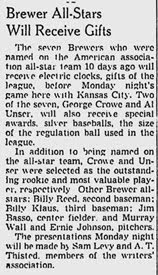 Crowe was also selected to the American Association All-Star team in 1951. In addition to the plaudits, he received more tangible rewards. 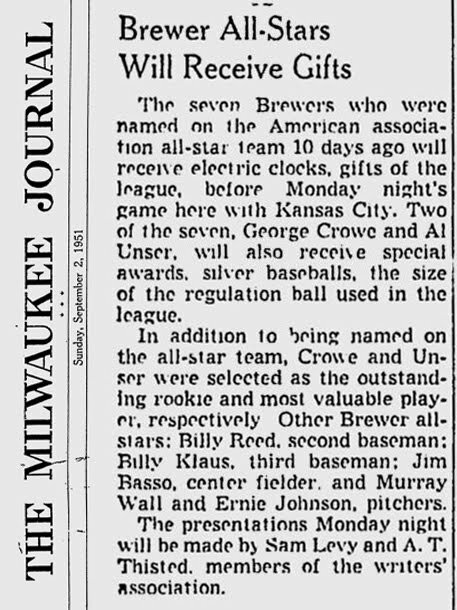 The Association gave their All-Stars electric clocks that season, Crowe among them. His teammate Al Unser, the Brews' catcher, was chosen as the Association's MVP, and for their work these two Brewers were given trophies in the form of silver baseballs. Regulation size, naturally. 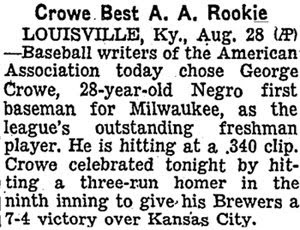 Crowe started off 1952 well, hitting .351 for the Brewers before being sent to Boston. His play was good enough to keep him in the Bigs, and when he moved back to Milwaukee it was with the rest of the Braves. Rest in Peace, Mr. Crowe. And thanks for everything.